For unconditional military defence of China! The following article is adapted from Workers Vanguard no 885, 2 February 2007, newspaper of the Spartacist League/US. On 11 January, a Chinese missile smashed to bits an aging Chinese weather satellite more than 500 miles above the countrys Xichang space facility. The exercise marked a significant advance in the ability of the Chinese deformed workers state to defend itself against a nuclear first strike by US imperialism. The threat of such an attack has grown with Washingtons plans to deploy a missile defence system in the Asian Pacific, which would rely on satellite technology. The US, British and Japanese governments raised a hue and cry over the successful test. This is rich coming from the British government which is currently seeking parliamentary approval to acquire a new generation of nuclear submarines to maintain Trident, the missile system acquired in the 1980s as part of NATOs arsenal aimed at the Soviet Union. With consummate chutzpah, a spokesman for Bushs National Security Council intoned: Chinas development and testing of such weapons is inconsistent with the spirit of cooperation that both countries aspire to in the civil space area. The US rulers overwhelming military might, far exceeding that of their imperialist rivals, not to mention China, includes extensive militarisation of space. In October, the administration released a new National Space Policy (signed by Bush two months earlier) declaring Washingtons unilateral right to deny, if necessary, adversaries the use of space capabilities hostile to U.S. national interests. In fact, this policy is principally aimed at preventing China from developing anti-satellite weapons. Behind the imperialist hype about mythical Chinese aggression lies a genuine military problem. The US war machine has become heavily reliant on a vast network of satellites for intelligence, communications, navigation and weapons targeting. The US owns or operates more than half of the 845 currently active commercial and military satellites in orbit. Dozens operate in low orbits similar to that of the destroyed Chinese Fengyun 1C satellite. According to Aviation Week and Space Technology (21 January), which broke the story of the anti-satellite test, the Chinese military can now credibly threaten imaging reconnaissance and other satellites operated by the U.S., Japan, Russia, Israel and Europe. Moreover, according to a US official, China recently painted US satellites with a ground-based laser, a potentially disabling capability. At considerably higher orbits are the Pentagons vital network of Global Positioning System satellites and other spacecraft. The International Communist League, of which the Spartacist League/Britain is a section, stands for the unconditional military defence of China and the other bureaucratically deformed workers states, North Korea, Vietnam and Cuba, against imperialist attack and internal counterrevolution. We support China and North Koreas development of nuclear weapons and the means to deliver them as essential to the defence of those workers states. The Chinese nuclear force, on the order of 200 warheads with an estimated 20 deployed ICBMs capable of reaching the US, acts as a deterrent against the US mass murderers who reduced Nagasaki and Hiroshima to irradiated rubble in 1945. China has been a target of the US nuclear arsenal, currently consisting of some 10,000 warheads, since the Korean War. For decades, the Soviet Unions nuclear force forestalled the imperialists from unleashing their deadly nukes. Since the counterrevolutionary destruction of the Soviet degenerated workers state in 1991-92, Washington has shifted much of its strategic forces to target China, the most powerful of the remaining countries in which capitalism has been overthrown. The Pentagons space forces are designed to ensure its first-strike capability by suppressing any counterstrike. It is notable that the recent Chinese and North Korean weapons tests were carried out with the US bogged down in its murderous occupation of Iraq. Indeed, the Democratic Partys principal objection to Bushs Iraq policy is that it diverts resources away from more strategically important targets like China. At the same time, the US has pursued the encirclement of China under cover of fighting terrorism. Treacherously, Beijing has embraced the imperialists war on terror in the interest of its economic relationship with the US. The US now has military installations in Central Asia on Chinas western flank and has enhanced its military presence in the Philippines. The Bush administration last year sealed a nuclear pact with India and in 2005 resumed open military relations with Indonesia. In Australia, long instrumental as a junior imperialist partner to the Pentagons global operations, huge US bases are under construction at Bradshaw and Yampi Sound. The 1949 Chinese Revolution overthrew capitalist/landlord rule and ripped the worlds most populous country out of the clutches of the imperialist powers that had long held China in their grip. Although deformed from its inception by the rule of a parasitic Stalinist bureaucracy, the Chinese Revolution laid the basis for collectivising the economy, resulting in enormous social progress for workers, women and peasants. Smashing the Chinese workers state is a strategic goal for the capitalist powers, who seek to turn China into a vast field for untrammelled exploitation and super-profits. In pursuit of counterrevolution, the imperialists are both increasing their military pressure against China and furthering their economic penetration of the mainland by taking advantage of Beijings market reforms. Defence of the workers states against imperialism is undermined by the rule of the nationalist Stalinist bureaucracies, whose policies are encapsulated in the dogma of building socialism in one country. The Stalinists oppose the fight for international proletarian revolution and instead pursue the futile quest for peaceful coexistence with imperialism. A glaring case in point is Beijings treacherous partnership with the US, Japan and others in the attempt to disarm North Korea. Following North Koreas successful nuclear test in October, China criminally voted for sanctions against Pyongyang in the UN Security Council. The Chinese Stalinist bureaucracy played no small part in the destruction of the Soviet Union, which had been the industrial/military powerhouse of the non-capitalist world. In the wake of a falling-out between Moscow and Beijing that began in the late 1950s, Mao Zedong pursued an alliance with American imperialism against the Soviet Union. This was sealed when Mao met with US Republican president Nixon in 1972 as American bombs rained down on Vietnam and Cambodia. In 1979, only four years after the victory of the heroic Vietnamese workers and peasants, China under Deng Xiaoping invaded Vietnam, acting as US imperialisms cats paw. The alliance allowed the US under Reagan to add to its anti-Soviet arsenal the bulk of the nuclear weapons it had aimed at China, at the same time tying down significant Soviet forces in the Far East. Following the demise of the USSR, China was placed once again in Washingtons cross-hairs. A directive signed by Democratic president Clinton in 1997 broadened the Pentagons list of nuclear targets in China. Since issuing a Nuclear Posture Review in 2001 that included China among seven countries targeted for possible nuclear attack, the Pentagon has moved into the Pacific five nuclear submarines carrying an estimated 720 warheads, including some with advanced Trident II missiles, according to the Federation of American Scientists. In pursuit of their own ambitions, the Japanese imperialists, who brutally colonised Korea in 1910 and occupied much of China before World War II, have embarked on a programme of military expansion whose principal targets are North Korea and China. On 9 January, the government of Shinzo Abe re-established a fully fledged defence ministry for the first time since World War II, with authority to deploy the military overseas. This is a significant step towards junking Article Nine of the US-imposed postwar constitution—long flouted in practice—banning Japan from maintaining military forces. According to the Japan Times (22 December 2006), Japan and the US signed an agreement in December to exchange detailed global topographic data—a move apparently aimed at sharing information specifically on North Korea and China. Japan is also planning to launch a fourth spy satellite this month that will complete its system of global coverage. Now it is reported that in February the US and Japan will discuss a joint operation plan for their troops for defence of Taiwan (Japantoday.com, 4 January). Beijing extends a hand to the bourgeoisie in Taiwan by pushing for its reunification with China under the formula, one country, two systems. The nationalist Stalinist regime thus pledges to maintain capitalism on the island, as it has done in Hong Kong following the reversion of the former British colony to Chinese control in 1997. In opposition to the Stalinists and to the reactionary forces calling for Taiwanese independence, the ICL calls for the revolutionary reunification of China: for socialist revolution to expropriate the Taiwanese capitalists and a workers political revolution to oust the Beijing bureaucracy, establishing a regime of workers democracy and revolutionary internationalism. To defend and extend the gains of social revolution in China, North Korea, Vietnam and Cuba requires fighting for proletarian revolution in the imperialist centres. Defence of the remaining workers states against imperialism and counterrevolution is critical to mobilising the proletariat in Britain as well as in the US and Japan against their own exploiters. Every advance in the workers states military capabilities buys more time for the international proletariat. Only when workers revolutions put the advanced technology and industrial capacity of the developed countries to use in an international planned economy will the basis be laid for a socialist society of material abundance. To this end, the ICL fights to build revolutionary Trotskyist parties as part of a reforged Fourth International. 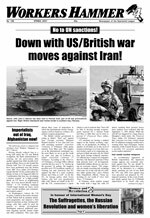 Down with US/British war moves against Iran! Imperialists out of Iraq, Afghanistan now! Down with the racist "war on terror"!